If you've got a friend who's really good at Battlefield, now might be the time to give them a call. Much like Gavin over at Miracle of Sound, my experiences with online FPS games have mostly revolved around throwing grenades at my own feet and shooting at everything that isn't other players. However, this announcement from EA has me thinking that perhaps I should practice a little more: With partners Virgin Gaming, EA will host the Battlefield 3 Worldwide Conquest Tournament in early 2012. The prize pool will be $1.6 million. The tournament, which the organizers say will be the biggest console competition in history, will be played completely online until the live "grand finale." The prize money will be divided amongst the best players at the event. Kurt Magnus Troedsson, General Manager of developer DICE, said that, "The Battlefield series has always been a very social experience with its best-in-class multiplayer gameplay and we're honored to have such passionate and loyal fans." He added that he thinks the tournament is "a great way to celebrate the gameplay and reward our fans." Even if it's split amongst the winners, $1.6 million is still a life-changing amount of money. As much as we may wince at the thought of some of the players we've encountered online being empowered with this kind of cash, there's still time for us to practice. 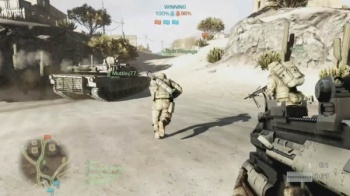 Battlefield 3 will be released on October 25, 2011.